Denmark, Belgium, and The Netherlands are three small countries that share many similar characteristics. All three are Constitutional Monarchies, all three share a border with Germany, all three stare down the North Sea, all three think strong black licorice is delicious, all three have languages that, when spoken, make a person sound like they have a throat ailment, all three have strong bicycle culture...okay, Belgium is doing some catch-up on that one...and all three have ordered intercity (long-distance) trains from AnsaldoBreda intended to be a backbone of rail service in each country. The company which now titles itself "AnsaldoBreda" was created through a merger of Ansaldo Trasporti and Breda Costruzioni Ferroviarie in 2001. It is a subsidiary of Finmeccanica, a conglomerate which in 1993 also acquired other now-unrelated divisions of the former Gio. Anslado & C., which also use the name "Ansaldo" as a prefix in their names. For example Ansaldo STS is a signals and automation company also owned by Finmeccanica but run separately from AnsaldoBreda, though they do work together on some products. Finmeccanica is partially (30%) owned by the Italian State. 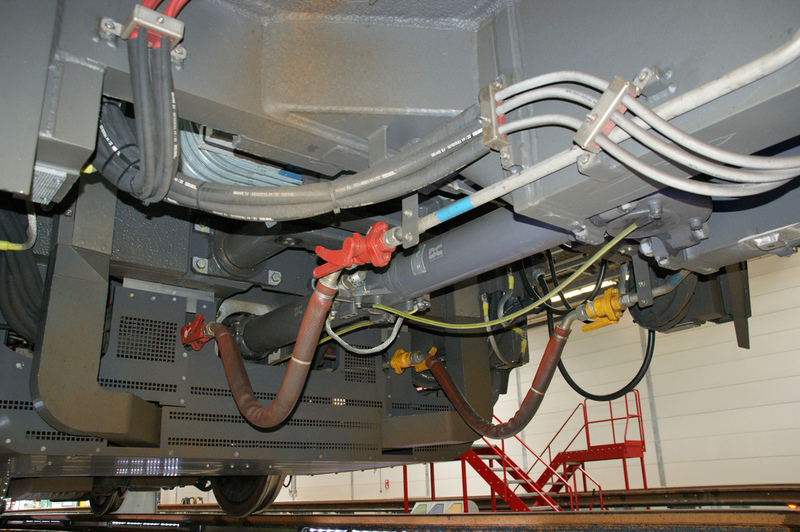 ...completely suspended operations of its new V250 trains built by AnsaldoBreda. The V250 trains only began service this past December, years after they had been promised, and had immediately become notorious for delayed and canceled trips. 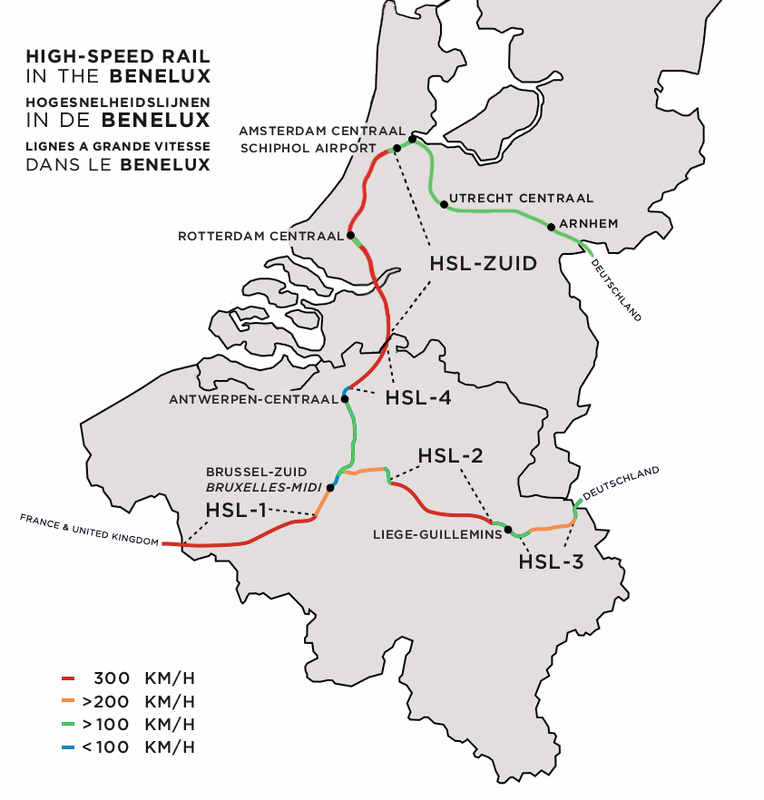 InfraBel is the Belgian track infrastructure authority and is separate from operator the Belgian Railways. On Thursday, January 17th, InfraBel discovered train parts on its portion of the new, specially engineered high-speed rail line ("HSL4") that runs from Brussels to the Belgian-Dutch border. These parts were soon discovered to have fallen off of the V250 after a particularly snowy day. 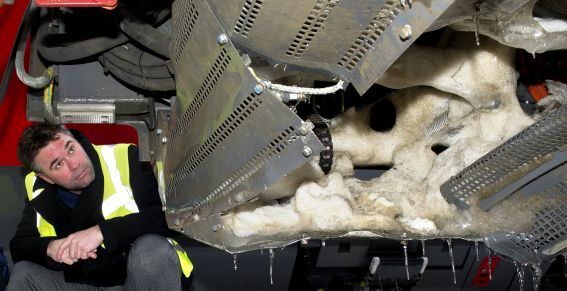 Except these were conditions that did not result in damage to Fyra's HSL4 companion, the Train à Grande Vitesse (TGV)-based high-speed trains run by the train operator Thalys (Paris-Brussels-Amsterdam and v.v.) on the same tracks. 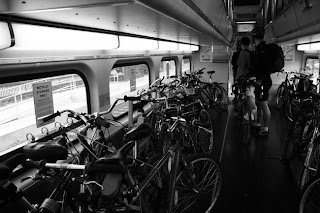 ...The Benelux trains carried bicycles! 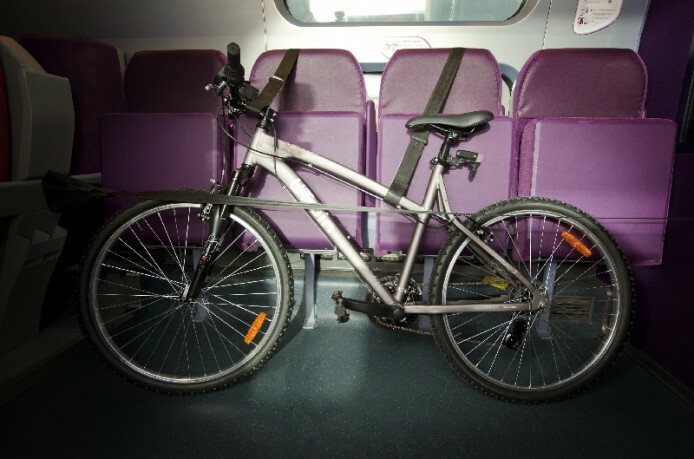 No box or bag required, just buy a bicycle ticket and roll on board into the designated bike storage area. ...Fyra would not carry bicycles! Nope, no way no how. Okay, if it was a folding bike, like a Brompton, in a bag, that would be alright, but no regular bicycles allowed...at all...on a train...that operates(or did for a while) in the Netherlands and Belgium. Such Heresy! Indeed, even the Thalys trains, allow a bicycle to travel inside a slip cover of certain dimensions with the front wheel removed. And then, on Thursday January 17th, it snowed. 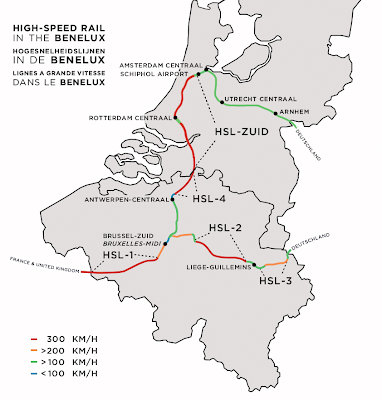 Fyra has announced that a shortened version of the Benelux train will return in two weeks, which is quite an amazing task given that the planning of train "path-slots" on the busy railways of Belgium and the Netherlands normally takes one or two years. Whether these substitute trains will take bicycles is not known. They will stop in The Hague, but owing to corridor capacity having been already reassigned, will not continue to Amsterdam. 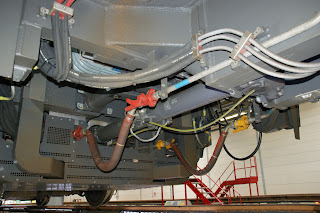 Connections at Rotterdam will be available. ...is not supposed to look like this after it snows. 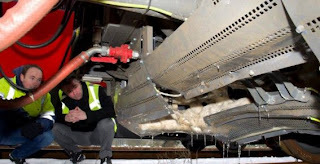 Needless to say, the whole situation is a scandal for the press in both countries to focus upon, the rail executives of both the Dutch and the Belgian Railways have been called before the Belgian Parliament and to meetings with the Dutch Government as well as television news interviews. Fyra/High Speed Alliance is losing many millions of euros on refunds and in revenues. 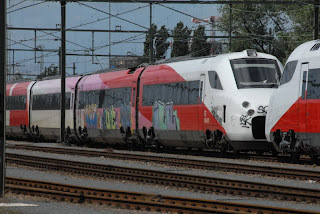 Because the V250 was to be the premier train product initially on the international service, and was to eventually replace the locomotive-hauled trains on the domestic service to Breda the City, it has itself become referred to as the Fyra Train. Or "Failra". Some speculate that the name is an acronym for"Forget Your Rapid Arrival". #Fyra has trended on twitter in both countries and has been used to describe other delayed and problematic AnsaldoBreda and Finmeccanica products. 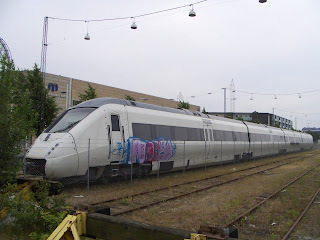 AnsaldoBreda's IC4, also sitting in the Yard. And this is not unlike the situation Denmark's State-owned Railways (known as DSB) has found itself in with its IC4 trains, or as the Flemish-/Dutch-speaking press now prefers to call it, "The Danish Fyra". More about that, and other AnsaldoBreda failures in part two next week, but the mere existence of these now delayed and outdated-design products may have an impact on the use of cycling on both sides of the Wadden Sea. The Internationally-renown Transit-Oriented-Development expert Robert Cervero of the University of California at Berkeley, in the USA, will tell you that bikes and walking are superb means of transport, but that they do have their limits, and that to extend the walk- or bike- shed you need a mechanical means to move mass amounts of people in to, out of, and between employment, activity and other centers (or "nodes" as planners are want to call them). Trains provide an ideal means of doing this, and have the benefit of being able to carry large numbers of people, and people with bicycles, per departure something that buses still have a hard time doing. Bicycles can be used at both ends either to get to the station, and/or complete the journey's "last mile". In The Netherlands, the preferred practice is to offer excellent and/or plentiful bicycle parking at the local station, and plentiful, easy to rent bicycles at most destination stations. Like Denmark, one can, outside of rush hours, also roll an assembled bicycle on to a train, and though one must buy a ticket for it, no reservation is required. This was also the policy on the Benelux Train into Belgium. 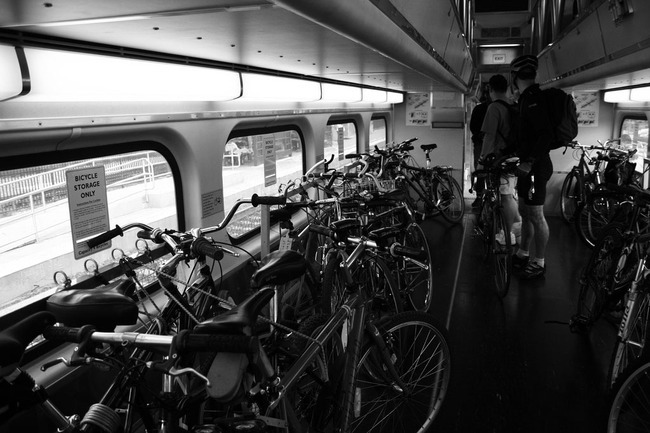 The trend in Europe, and for that matter in North America, is that in the past twenty-five years, more and more local and regional trains have been either redesigned to accept, or replaced with rolling stock better suited for bicycles. At the same time, longer-distance Intercity trains in Europe have been upgraded to high-speed trainsets, moving away from the traditional locomotive-hauled cars/carriages/wagons into which a bicycle car could be easily introduced; on some routes, the only train using this older arrangement is the overnight train with sleeping accommodations Many of these newer high-speed trainsets were designed to be as light-weight and as low profile as possible for maximum efficiency. They were designed years before the beginning of Bicycle Culture 2.0 and so usually either ban bicycles like Fyra or made transportation of bicycles a bit of a hassle like Thalys. The original TGV was designed in the mid-1970's, and, after conversion to electricity due to the same 1973 Oil Crisis price spikes that gave rebirth to cycling in Denmark and the Netherlands, entered service in 1981. The first trainsets are now reaching 30-plus years in service and so are being rebuilt to extend their lives. As these first sets are refurbished, bicycle accommodations are being added to them making them more friendly to bicycle carriage than newer trainsets. The big problem for cyclists with the delays to the IC4 and the Fyra V250 programs is that these are still new trains, just not built with bicycle carrying capacity in mind, and if their "teething" problems are ever fixed, their service life-clock will then start. They will at that point probably be decades away from their mid-life re-buildings during which a storage solution for assembled-bicycles might be installed. In Denmark presently with the IC4s, where bikes are allowed to be taken aboard, software and coupling issues are such that often only a single trainset, not the intended four, is the maximum allowed to operate each departure to which the IC4 has been assigned. So bicycle and seating capacity on these departures is lower than it was intended to be. In Part Two, I'll present the track record to date of the clowns at AnsaldoBreda and why they are leeches on the rail and transit industry.